It’s about the product and the service in providing the West Michigan area with premium propane. 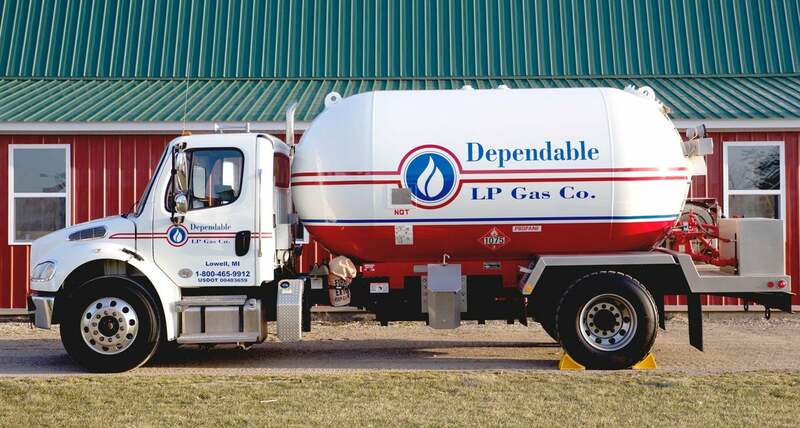 The family owned and operated Dependable LP Gas Co. lives up to its name, providing residential and commercial/agricultural propane to an approximately 40-mile wide radius of satisfied West Michigan customers. This delivery radius includes Kent, Barry, Montcalm, Ionia, Newaygo, and Allegan counties. We make sure we keep your home warm in the winter, your morning shower good and hot, and also provide for the unique propane needs a farm or business may have. You have only to call us. We can do it your way. We will set you up with automatic refill if that is your wish, or keep your tanks filled on a “will call” basis – you call us, we come. We can even set up a budget plan for you for your convenience. You will find our rates competitive and our service prompt. We won’t charge you for the lease of the tanks and will maintain them for you as well, ensuring that you have no leaks or blockages in your tanks. We do not charge installation fees either.We will guarantee our worry-free equipment, installation, and service, and do it with a smile. Your trust matters, and we will earn it.